More women are running for the Washington state Legislature this year — than possibly ever. 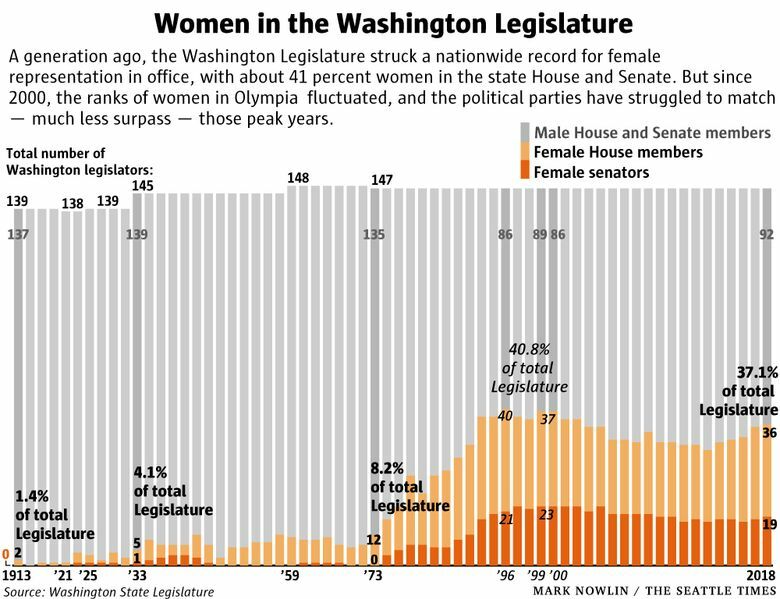 But after breaking records for female representation a couple of decades ago, women have struggled to break the glass ceiling in Olympia. Will the 2018 elections be different? After her 1998 election victory, Washington state Rep. Ruth Kagi headed to Olympia as part of history. About 41 percent of lawmakers at the Capitol during the next two years were women — the highest for any state Legislature in the nation’s history. But Washington broke one glass ceiling only to hit another. Since then, the number of female state lawmakers has fluctuated — and never again reached those highs. Kagi and other current and former women lawmakers in both major parties suspect fewer efforts were made to get women to run for office. Kagi’s comments came one night last week as she stood among more than 75 people in a North Seattle community center, at the campaign kickoff for Lauren Davis. Kagi, who is retiring, helped recruit Davis to run for her seat. 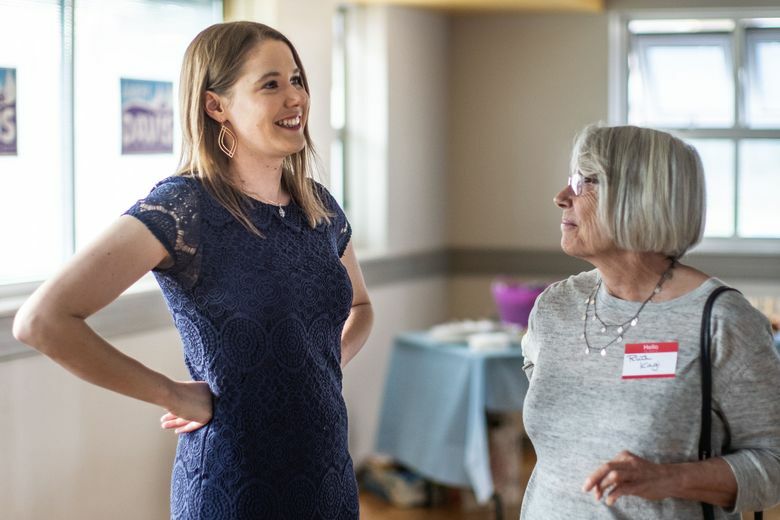 Davis, a 31-year-old Shoreline resident and executive director of Washington Recovery Alliance, is among what appears to be a record number of women candidates. She’s one of roughly 105 women running for state House and Senate in the Aug. 7 top-two primary — the most to file in at least a generation, and perhaps in state history. Those legislative candidates join a record number of women running for other offices, here in Washington and across the nation. Some have been fueled by the #MeToo movement, opposition to President Donald Trump, or continuing frustration over a lack of equal representation in government. Still others just want to make a difference in their communities. Davis said she got involved in politics in recent years as she worked with state legislators on suicide-prevention bills. Putting women on the ballot is only half the battle: For a variety of reasons — including a slew of retirements and intraparty battles — the number of women serving in Olympia may not increase. In the overwhelmingly Democratic 32nd District, Davis is going up against Democrat Chris Roberts, a Shoreline City Council member, and Republican Frank Deisler. Davis, who among other things is running to boost early childhood education and stem gun violence, said women can be effective by bringing a different leadership style. Candidate filings going back to 1990 show that during many election cycles, only 60 to 90 women file to run for the Legislature. To boost their presence this year, women must confront a dizzying number of dynamics across Washington’s 49 legislative districts. 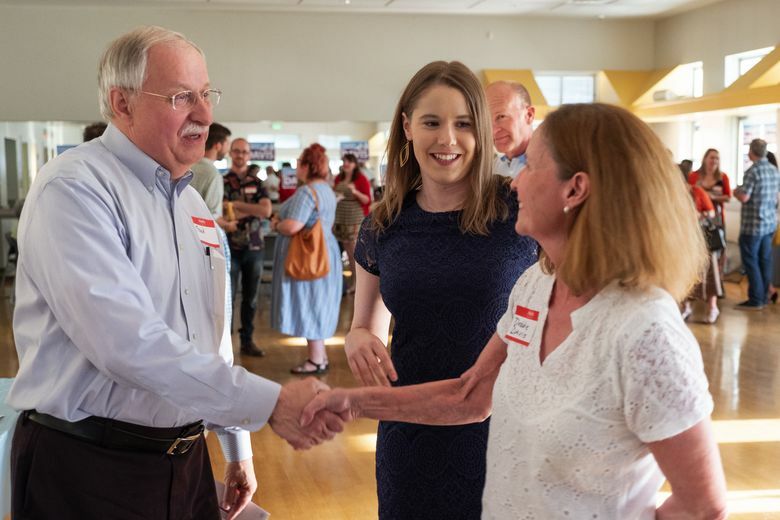 In the 32nd District, which includes parts of King and Snohomish counties, Davis isn’t the only woman facing a challenge. Longtime Sen. Maralyn Chase, D-Edmonds, is being challenged by two men, Shoreline Deputy Mayor Jesse Salomon, a Democrat, and Republican James Wood. Chase said she’s running again to continue her work as chair of the Senate Economic Development & International Trade Committee. That work would include focusing on how workers will be affected by increased automation, she said. In this district, politics is trumping gender, with Kagi backing Salomon. Chase, meanwhile, is backing Roberts, the man running against Lauren Davis. Kagi is one of roughly a dozen lawmakers retiring this year — most of them women. It’s already clear a woman will not succeed retiring Rep. Joyce McDonald, R-Puyallup. Two men have filed to run. And it’ll be tough to replace Rep. Liz Pike, R-Camas, where a Democratic woman is running against a Republican man in Southwest Washington’s conservative-leaning 18th District. There, the GOP often wins by 15 or 25 points. Meanwhile, five men and one woman are vying to replace retiring Rep. Kris Lytton, D-Anacortes. The surprise retirement earlier this month by Sen. Jan Angel, R-Port Orchard, pits GOP candidate Marty McClendon against Democrat Emily Randall and independent Bill Scheidler. In Bellevue, Democratic Sen. Patty Kuderer faces a challenge by Democrat and former Sen. Rodney Tom. Tom is famous — or infamous, depending on your view — for crossing the aisle several years ago to form a majority coalition with Republicans. Elsewhere, multiple women are running for one seat, or Democratic challengers running east of the Cascade Mountains are up against Republican men in conservative-leaning districts. Women could gain the seat of Rep. David Sawyer, D-Tacoma, who was recently stripped of his committee chairmanship amid an investigation into allegations of inappropriate behavior toward women. Sawyer, who has denied those allegations, faces a challenge from Democrat Melanie Morgan and two Republicans. Morgan has scooped up endorsements from some area lawmakers and state Attorney General Bob Ferguson. “It’s been a long time since we’ve had a woman of color in our district, and I’m hoping to be that representative,” said Morgan, a 50-year-old Franklin Pierce School Board member who lives in Parkland. Meanwhile, several men retiring — including GOP Reps. Dan Kristiansen of Snohomish, Larry Haler of Richland and Jay Rodne of Snoqualmie — will be succeeded by other men. No women filed for those seats. Caleb Heimlich, chairman of the state Republican Party, said his party looks for candidates who best fit their districts, regardless of gender. He noted a handful of GOP women running in potentially competitive races this year, such as Kelly Chambers, who could win another Puyallup-area House seat. And Heimlich blamed Democratic House Speaker Frank Chopp of Seattle and his party for running hard against Republican women candidates in 2016. Democrats that year unseated two GOP incumbent women, one of whom was replaced by a man. “If there are fewer women elected, it’s because of Frank Chopp,” Heimlich said. Chopp, however, leads the only caucus in Olympia that has roughly equal representation between women and men. Like Kagi, the career of longtime Republican lawmaker Linda Evans Parlette coincided with the historic peak in woman legislators. Parlette, who was first elected in 1996 and retired in 2016, said she was originally recruited not by GOP party officials, but by people unhappy with the party’s preferred candidate. When deciding to run, she went through a mental checklist that took into account the fact that her children were growing older, and that her husband and parents were in good health. But the parties shouldn’t necessarily do more to get just any woman in office, and “I would say finding the right person at the right time is more important,” she said. Voters this year will see a different former Republican lawmaker named Linda on the ballot. Linda Kochmar is the Federal Way Republican unseated in 2016 by Rep. Mike Pellicciotti, a Democrat from the same city. A former City Council member in Federal Way, Kochmar said she’s concerned her city will inherit Seattle’s homelessness problem. It’s a long way until November, and it’s unknown how each race will sort out.